Find Your Next Trail to Hike - Musketeers Too! Yes, the worldwide web is like an adventurous trekking journey. As a matter of fact, I find inspiration for innovative ideas with a short hike every day. Here’s your chance to explore Vermont and the upper valley of New Hampshire and kindle your own new ideas with with this Trail Finder Website. 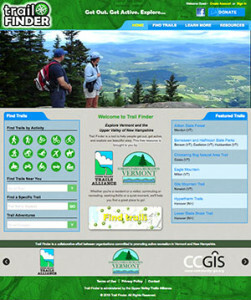 Trail Finder is a tool to help people get out, get active, and explore the beautiful outside.